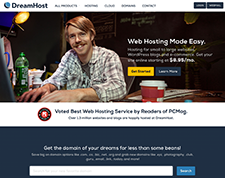 DreamHost is one of the oldest web hosting companies on the internet today. Founded by four computer science majors from Harvey Mudd University in 1997, they have grew to become one of the largest web hosting companies on the internet. Dreamhost is a California based, employee owned hosting company that is the leader in budget web hosting. They have hosting solutions that are perfect for those just getting started in hosting. Customers benefit from great hosting packages at excellent prices when hosting with DreamHost. The DreamHost hosting packages offer more for their money than customers would find with many other hosting companies. The only real downside to the pricing is that if you pay on a month to month basis, they do charge a setup fee. DreamHost favorite plan is their “Shared Hosting” package. This plan includes unlimited MySQL databases, free domain name registration, PHP, full CGI access, to name just a few things. Customers can also host unlimited domain names with their web hosting service. This is an even greater value for the money. Therefore unlike other web hosts who operate out of rented servers they have their own data centers which are networked by redundant connections and equally supported by multiple carriers. Having multiple carriers support their network gives them one big advantage, that is, in an unforeseeable circumstance when one of the carriers goes off service their networks will remain connected through other carrier. DreamHost always keep their bandwidth unsaturated and carry a network capacity which they can use to cope with double load if required. Developed entirely in-house, Dreamhost custom web panel can’t be found anywhere else. Having access to the nuts and bolts of the entire hosting operation enables them to add features to the panel based on direct customer feedback. Their web control panel is an integral part of what they offer, and we believe it to be the fastest, most feature filled account control panel in the industry. You can access your billing information, create or modify your MySQL databases, configure your account, create email aliases, and much more. Customer Support at DreamHost is an enjoyable experience with their easy to follow “three steps to customer support”, at DreamHost a customer has the option to get support through a number of options, almost all the options known to the web hosting industry. They have all the regular options like, ticket, email, forums, knowledge base and a unique “Call Back” option, by using this option a customer can email the support staff with their question and ask them to call back at a time convenient for them. DreamHost offers 24 hour email support and now also 24/7 Live Chat support – which is a nice feature. They work hard to respond to emails as quickly as possible, usually within a few hours. Dreamhost offer a support system second to none with some original features built into the package as standard all for a price that would be hard to beat. If you are looking for a dream host for your hosting needs then look no further than DreamHost! Love dreamhost hosting. Good prices, smooth hosting and they have some pretty awesome backend tools in the panel. Was looking for a good business hosting company and they definitely took care of all my needs. Great company. Dream host hosting keeps my business going smooth. Never had any problems with them. Uptime has been good and only had 1 time where my site was unavailable for about 10 minutes…called in and they solved the problem immediately. Knock a point for that. Other than that they’ve been a great hosting solution for me and my business. Great hosting company. Been running my blog and my side business with them for a long time. Great customer support and cpanel is really flexible with lots of features. They give some nice vouchers for marketing and stuff. Hosting uptime has been superb, definitely my favorite and i’ve been with a couple other hosts in my time. dreamhost is a great hosting company. I’ve been hosting my band’s site with them for over a year now and have no complaints. Smooth hosting with no downtime (knock on wood)…site building tools are helpful and a lot of extra hosting tuturials that were helpful for me when i was starting out. Found them through another site and they seemed pretty cheap and had good reviews. Don’t know a ton about hosting but my brother said he’s heard of them and they are a pretty big company…so that makes me feel better. Overall i haven’t had any problems and my site hasn’t gone down once…i guess that’s a good sign!